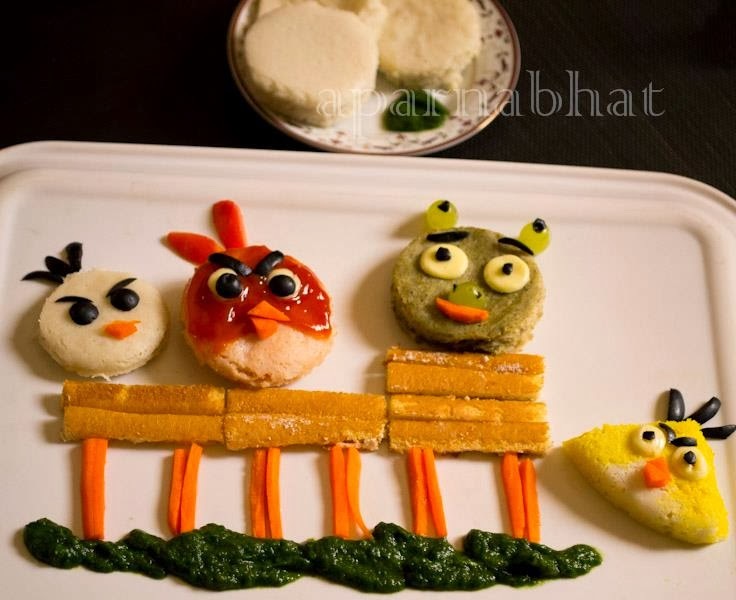 IDLIS disguised as angry birds that will fascinate our kids to eat them. Myself, never played this game of angry birds and so wasn't aware of this character. "A" [elder son] neither played it but then he was aware of the character and used to get very excited as he saw them in pics/posters/ t shirts/ shoe designs ... I decided to find about them via google search. While browsing for their pics, I came across a cute creation of various angry bird characters made out of eggs. I wanted to create something similar to surprise my son. I adapted the idea and created as per availability of the ingredients in my kitchen. Idlis is what came to my mind to use for this creation in place of eggs. Make idlis from idli batter. Saffron milk spread on 4th one to give that yellow color. Topped with olives, cheese slices, [used to make eyes and eyebrows], sliced olives and tomato slices [feathers], carrot pieces [for beaks] , grapes [ears]. Carrot sticks, swiss rolls [ u can use waffles] green chutney have been used to give fence look on the plate. Hope kids gonna love these idlis and attack them like hungry [not angry] birds from their plates. This idea would work like wonders for kids party. Servings portions will depend on the size of idlis and also no. of other snacks/goodies at the party. Good to see you turn the creations into a blog.. :) All the best..
Never ever seen so much of creativity ever!